The United States government has announced plans to sell weapons to the East European nation of Ukraine. The sale of an undisclosed number of Javelin missile launchers was agreed upon by White House officials on December 22 after many years of hesitation. In recent history, the United States has provided hundreds of such weapons to Baltic countries. On Dec. 18, 2015, it sold $55 million worth of Javelin missiles and Command Launch Units to Lithuania in response to increasing Russian aggression toward its former satellite states. The Javelins won’t end the conflict, but they will help Ukraine impose a higher cost on Mr. Putin for his aggression. The Kremlin reacted with anger and said the weapons could “derail” the peace process …. The idea that Russia is committed to peace in the region is laughable considering the strong moves its military has made in attacking Georgia and annexing Crimea. Eastern Europe’s purchase of defensive weapons technology is indicative of a growing trend in global military spending. The region with the fastest-growing defense expenditures, not surprisingly, is the Baltics region in Eastern Europe. Estonia, Latvia and Lithuania are facing increased pressure from Russia as Moscow looks to expand its influence westward. Other countries in Russia’s ever expanding sights—such as Belarus, Ukraine and Georgia—are all following suit. Reports say that the pace of spending is reaching that of Cold War levels. Dougherty commented that this is a huge indication of just how tense and unstable the world is becoming. Trumpet writer Richard Palmer reported in 2017 that countries like Lithuania and Ukraine are becoming increasingly desperate as Russia takes steps to reclaim the territory it lost at the end of the Cold War. With each failure by nato to check Russian expansion, they know that relying on their Western allies is equal to national suicide. Therefore, the solution is an increase in military armament. 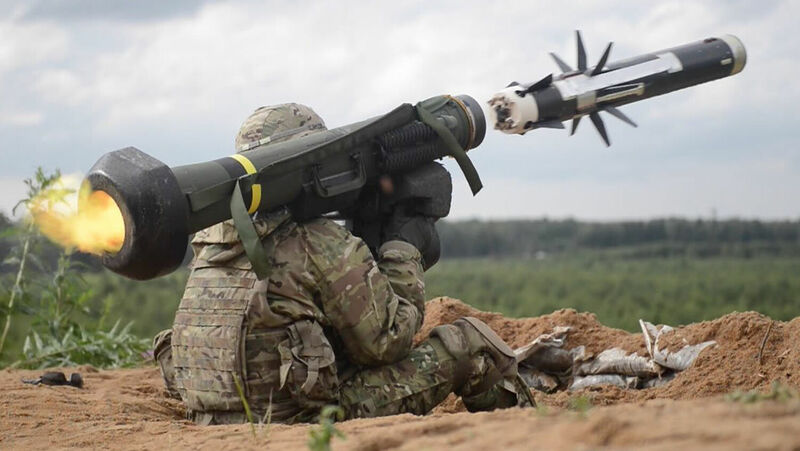 Some might argue that the sale of Javelin missiles to Ukraine is an indication of America’s commitment to defending its ally’s sovereignty. However, while U.S. manufacturers are more than willing to sell weapons to the nations of Eastern Europe, the U.S. government is still hesitant about upholding its end of the nato security pact. Under the Trump presidency, the U.S.’s reliability is being called into question even more. After three days of trans-Atlantic meetings in May, German Chancellor Angela Merkel, who is undoubtedly one of the most influential leaders in the world, said that Europe could no longer depend on America. Our allies must contribute toward the financial, political and human costs of our tremendous security burden. But many of them are simply not doing so. … We have spent trillions of dollars over time on planes, missiles, ships, equipment—building up our military to provide a strong defense for Europe and Asia. The countries we are defending must pay for the cost of this defense—and, if not, the U.S. must be prepared to let these countries defend themselves. Thus, we see increased military spending in nations like Ukraine, Lithuania and other countries under the looming shadow of Russia. With U.S. support of nato at an all-time low, they are desperately doing what they can to prepare for a potential invasion. Your Bible tells you what is going to happen next! Revelation 17 shows that soon nato will collapse and the EU will consolidate into a powerful coalition of 10 nations. Herbert W. Armstrong foretold this outcome for years, and the events we are seeing today indicate this massive shift is beginning. With Russia further expanding its reach, soon weapons like Javelin missile launchers will not be enough. The countries of Eastern Europe will have no choice but to look to a “United States of Europe” for their defense. If you wish to know more about the prophesied failure of nato and the withdrawal of U.S. support of Europe, listen to Trumpet executive editor Stephen Flurry’s Trumpet Daily Radio Show “The Prophesied Breakup of NATO.” To learn more of Mr. Armstrong’s Bible-based prophecies and how they have come to pass, request our free booklet He Was Right.